It's actually an analogue delay line using two 3207 BBDs operated in an unconventional manner which can create delays between 0.5mS and 15mS. I wondered whether 'flanger' was the right name for this module since it has no internal LFO and can be used for other duties including a very nice chorus and real time vibrato effect. You may wish to call it something else if you desire. The first run of boards had a few errors. One of which was quite serious and requires component lead yoga and a couple of flying wires. That ain't good enough for release so a new board has been designed and is ready to be ordered for shipping late April or early May. 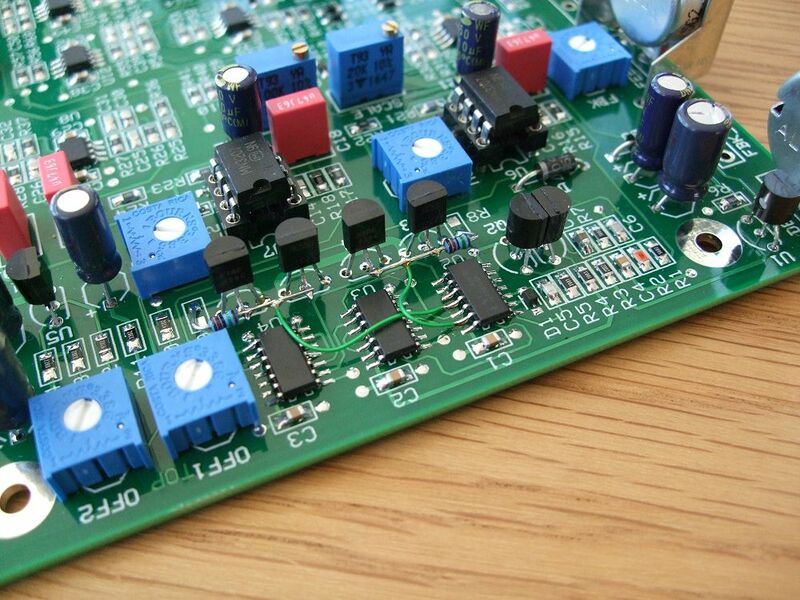 This board is built partly with surface mount dual op-amps, resistors, diodes and capacitors. The passives are all 0805, the ICs are SO and the diodes are SOD23. It can be soldered by hand with a standard iron and solder. Indeed, some of you may enjoy the soldering process so much you'll be wanting more SMD stuff from me. Great news Tony, really looking forward to this and hopefully a few more new 5U modules over the rest of the year. Once pricing info is available I will pre-order. i bought a cheap smd practice kit from ebay, 99p free delivery! god knows how they can sell so cheap. not tried it yet tho. so to use it as a standard flanger youd just need an LFO ? ... so to use it as a standard flanger youd just need an LFO ? Yes. Triangle wave will give you the traditional flanger sweep sound. Although you can use an envelope follower or any other CV. Both negative and positive feedback pathways are supported. The MIX output is the one to use here. It can also self oscillate if needed. For chorus you'd also use triangle wave LFO but with a slightly longer delay time and less modulation depth. Like the flanger the MIX output is the one to use. A sine wave LFO is useful for vibrato but this time you need to use the DELAY output. Yes! Instant order (maybe 2) as soon as this goes "official". I personally find SO ICs easier to solder than resistors our caps, just because the parts are bigger. Very excited about this both in terms of function and assembly. Quick track recorded using an Oakley modular to showcase the Oakley Flanger module. Lead line is one VCO passed through a DLF filter, Discrete VCA and onto the Flanger. Bass in the second half is the same patch but this time the filter is being swept with a VRG and the flanger module is used to create a deep chorus sound. Some reverb used on the leadline and plucked bell sound. Simple traditional VCO-VCF-VCA patch. First part is completely dry, and then other parts sent into the Flanger module. Settings changed manually as the same simple sequence goes round and round. Second and third show the chorus sound. Fourth bit decreases the delay time to give the classic flanging - increasing the feedback creates a deep flanger sound. Fifth bit is another flanger but uses negative feedback. Sixth part is manually altering the controls for excessive effects, firstly with positive feedback and then negative feedback. Standard VCO-VCF-VCA patch using the flanger module to shift the pitch. Firstly you hear the pitch being bent by an EG triggered from the gate on a simple riff, then a filtered constant pitch sawtooth being pitch shifted by a LFO - firstly subtle and then more extreme. The final samples in this collection are filtered white noise being flanged. The delay time and feedback controls are being manually altered. The first part you hear is positive feedback and the second is negative feedback. Can't believe I missed this announcement. A couple of these and a quadrature LFO will probably make an awesome stereo chorus. I really hope Krisp1 will add these to his production. I've not tried with a quadrature LFO but using just a traditional triangle LFO with one Flanger module set for positive CV modulation and the other Flanger module with negative CV modulation will give you the classic Roland chorus sound. I would love to see a full line of smd boards. That way one board is both euro and 5 high. Maybe leave some through hole where it matters for caps and other devices that affect the sound. But for most circuits it doesn't matter. Uses less power too. Let's you offer multiple functions on one board. More space for more tie points....love it! Oh yea and I'll take two of those modules. You could offer prepopulate smd parts. Board house does that pretty cheap. Hm, I don't know - just started a bit of SMD soldering in Eurorack and it does not feel like being joyful on the long run. So this is probably not for me. Nevertheless the Flanger seems to sound nice. Just waiting on a dual gang 10K pot from Banzai to test the new board issue. And whilst waiting on this rather blustery May Day Holiday I shall be continuing to write up the Builder's and User Guides. Boards should be ready for sale before the end of the week - I hope. PCBs are now available to order. Full project documentation will be ready in the next couple of days. 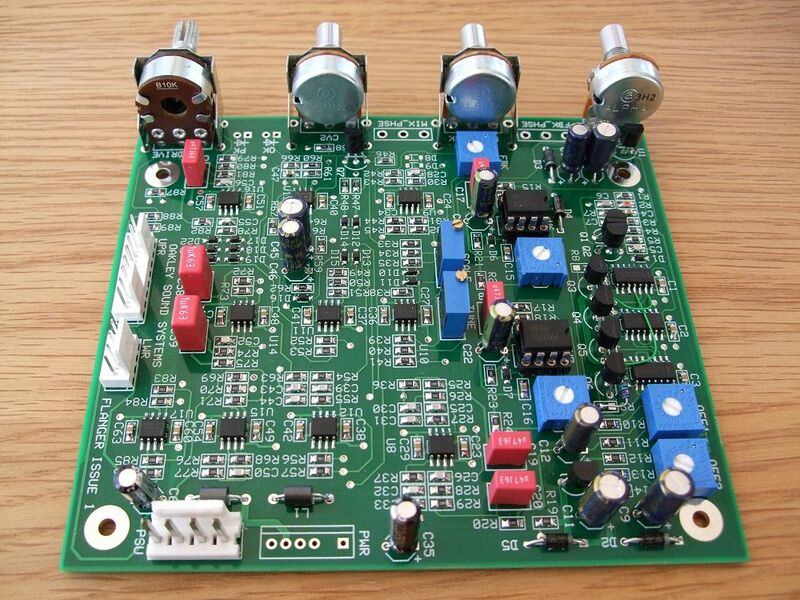 I also have a completed issue 1 prototype board available for purchase. This works exactly like the new issue 2 and is fully functional. It does however have a couple of issues. Firstly, to get it to work properly I have had to cludge a couple of wires and resistors (see lower picture). Secondly, the I/O headers that go to the Sock6 or socket field have been wired the wrong way around. That is, pin 1 now goes to pin 8, pin 2 goes to pin 7, etc. Both these slip ups have been corrected in the new issue 2 but if anyone would like this one then the price is 120GBP plus the usual shipping costs. Panel, switches, sockets, LEDs and board interconnects are not included - it's just the pre-populated board. I am planning to build one in the near future and I am currently sourcing components. Will this do for the tempco? Unfortunately is the only one I can find that is under specifications and I have to buy 10 of them. Will this do for the tempco? That's the one I used. You can use an ordinary 1K resistor if you are not too bothered about a very small amount of drift in the delay time. Just wanted to rectify my above post on this. 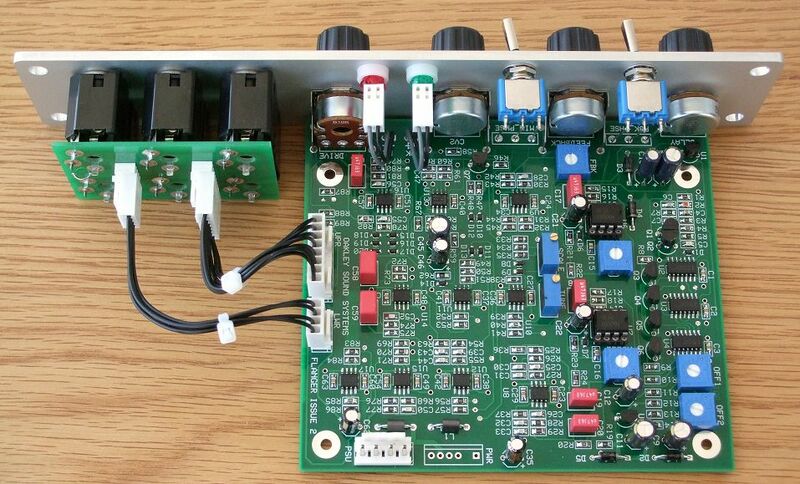 I did built the flanger, it was an interesting and challenging project but not too hard. Silly mood or not - sounds very good. Nice job.